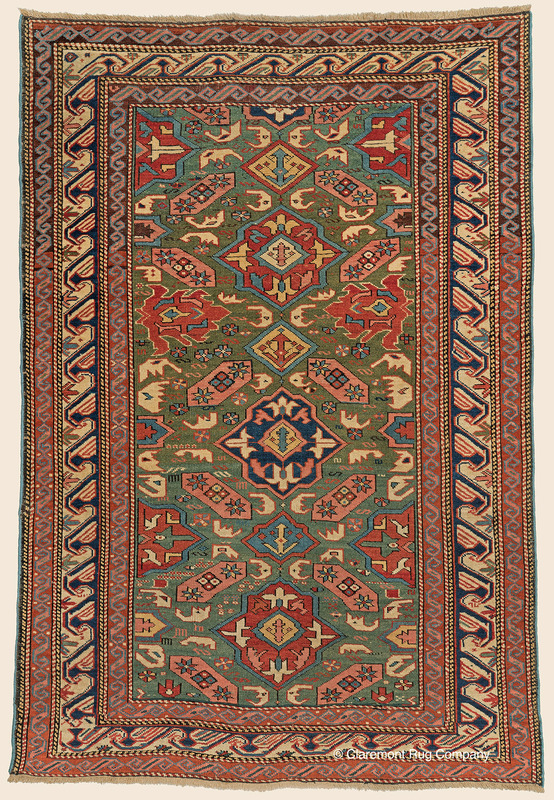 Search Our Inventory / All Rugs / 3&apos; 7" x 5&apos; 2"
3&apos; 7" x 5&apos; 2"
Convention is brilliantly upended in this innovative representative of the rarely encountered Alpan Kuba supgroup of antique Caucasian rugs. Eschewing the traditional dark blue background, the field of this unusually finely woven tribal rug is awash in a deep pistachio green, rarely seen in such profusion. Spaciously placed traditional motifs create a whimsical, engaging effect in the field that is beautifully framed by the lyrically drawn �Ocean Wave� in the main border. Many clients select from our seemingly endless collection of area size rugs (3'x4'-5'x8') to enliven the smaller spaces of their homes.